The Duo Air Gate LS GK, together with its simultaneous dusting of non-conductive surfaces, is a highly developed and efficient aid in the removal of electrostatic charges. The device reduces negative impacts on production so that quality losses, as well as high numbers of rejects, can be almost completely eliminated. This reduces production costs considerably. The Duo air gate is especially suitable for high operating speeds (≥ 150 m/min. ): thanks to the parallel emission of positive and negative ions, the charge loss is minimized during the neutralization process. The Duo air gate consists if a basic air gate and two ionizing bars from the HAUG product range. 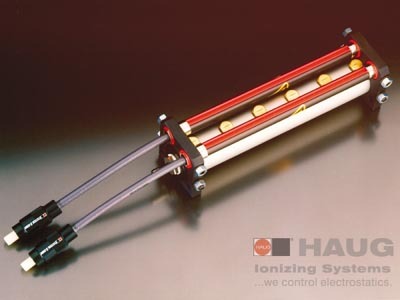 The HAUG ionizing bar EI Ex T is used in potentionally explosive areas. A suitable power pack provides the high-voltage supply. The circular construction of the EI RN ionizing bar permits exact axial adjustment in the direction of travel of the material. By using this powerful and robust device it is possible to remove surface charges reliably and effectively, even at igh operating speeds. Compared to the standard version the EI VS ionizing bar offers a considerably increased efficiency. Just as with the EI RN, the special features of the EI VS are the reliable and removing contact system X-2000, the special stainless-steel electrodes and the convenience of being safe to touch. Production processes in the surface treatment of paper, leather and plastic webs, as well as in laminating and coating equipment, can be optimized by using air gates. Air gates with integrated ionization for dust removal are mainly used in the following fields. Production processes in the surface treatment of paper, leather and plastic webs, as well as in laminating and coating equipment, can be optimized by using air gates. Contamination of pressure tubes and precision nozzles reduce the performance of HAUG air gates. Regular and careful cleaning with the special cleaning agent SRM 1 and the cleaning kit RS 1 ensure long service life and constant efficiency. Please order ionizing bars separately!